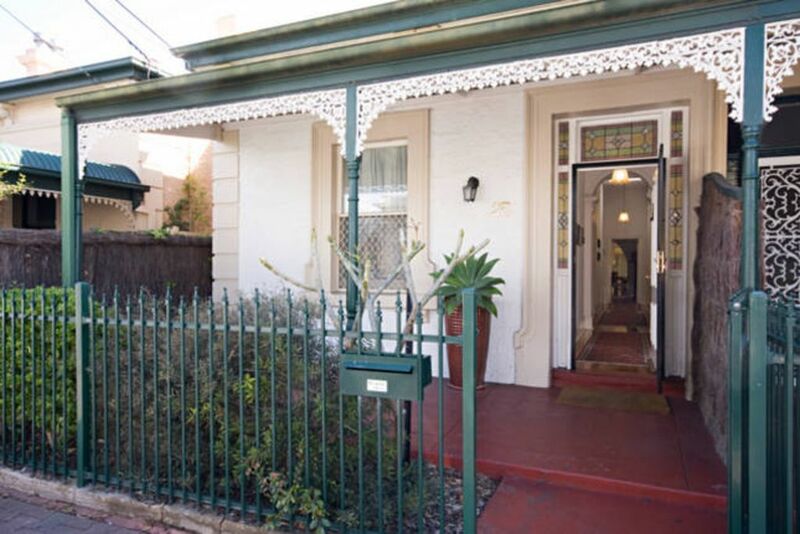 Gordon Street Cottage is loacated in the heart of Glenelg. We offer premiuem self contained accommodation that will make your vacation experience enjoyable, relaxing and comfortable. We are situated within walking distance to the beach, Holdfast shores marina, Jetty Road shopping presinct and the famous Glenelg tram. Built in the 1890's the cottage is full of charming features like decorative high ceilings and fireplaces, polished floors and original woodwork. Recently upgraded Gordon Street Cottage is fully self contained. Linen and towels are provided. The kitchen is generously equipped with all appliances , crockery and untensils. The bathroom has a shower and a bathtub and also has for your convienience a washing machine and clothes dryer. Relax at Gordon Street Cottage and enjoy your stay knowing you are close and central to all shopping, cafes, restuarants, hotels, all transport and a short stroll to the beach. It is the perfect place to base your stay in adelaide close sporting venues, wineries, water sports, and tourist attractions. Gordon Street Cottage has three bedrooms. first bedroom has a queen size bed, bedside tables, chest of drawers, wardrobe. Quality bed linen, towels and extra blanket are provided. Second bedroom also has a queen size bed, bedside tables, chest of drawers, wardrobe. Luxury and quality bed linen, towels and extra blanket is provided. The third bedroom contains two single beds, bedside tables and wardrobe. Each bed has quality bed linen, towels and an extra single blanket. The lounge has comfortable leather sofas, large coffee table, a 32cm LCD screen television and a DVD player. The dining area has a elegant solid wood table with six chairs. Please note our nightly rate is based on 2 adults .Extra guests is $25 per person per night. Deposit of $300 is required to secure the booking. Payment of the rental deposit constitute the clients' acceptance of these terms and conditions . Balance of the rental amount must be received in full 7 days prior to occupancy. If not, the owner has the right to cancel the booking and attempt to re-let it. Cancellation if caused by the client, money paid is not refundable unless the house is re-let or the owner is given sufficient time to re-let it for that entire period. If a refund is made due to the property being relet, then a $50 cancellation fee will apply. The owner will make every effort to ensure the property is available as booked. However the owner reserve the right to make alterations to booking due to unforeseen circumstances . Parties and functions are strictly prohibited. The price charged is for domestic use only and not commercial . Accordingly this rate does not allow for the extra wear associated with functions in terms of cleaning, garbage removal, wear and tear, repairs etc. Use contrary to this may result in loss of your bond and / or additional payments. Damage, breakage, theft and loss are the tenants responsibility during their stay. Departure - the property should be left in a similar state to its condition on arrival. Checkout time is (TIMEOUT) by the latest, to allow time to prepare property for next guests. Disturbance to our neighbour , including excessive noise, is prohibited and may result in termination of rental and loss of bond. Bond is payable at the same time as the balance amount. The bond will be refunded within 10 days in full subject to the above conditions being met. Great location, clean, well set out. The only downfall was with the extreme heat the bedrooms were very hot without air conditioning. First up, we'd like to say how lucky we felt to have found Gordon Street available at such short notice on a festival weekend. The location was perfect and we really appreciated the period style property. We did, however, base our choice on the numerous reviews which we quickly realised related to previous owners. This was clearly evident by the absence of 'soft amenities' (other than the bits and pieces left from previous guests) and maintenance issues that remained despite previous comments left in the guest book. * Front verandah not cleaned down. * Bits and pieces of tea, coffee, sugar left from previous guests (one jar with a little bit of very old stale coffee covered with a piece of glad wrap). If you're going to use guest supplies to service others, at least try to disguise it by presenting nicely. We arrived on late interstate flights with elderly parents for an urgent funeral and brought very little based on old and incorrect reviews. * Black board not very welcoming ("Dear guest...welcome...please put out the bins"). * Mould in the bathroom (reported previously). * Hot and cold markers in the bathroom basin mixer are reversed. This is VERY dangerous, particularly for elderly guests and not compliant. * Cleaning not up to standard (wall behind the kitchen bin for example). * No top sheet on one of the single beds. * Lamp shades all crooked (silly little things but show lack of attention and care). Based on the sale photos on www.realestate.com.au, it seems there have been no improvements or changes since the sale in 2016. We feel the property has so much potential to live up to its previous reviews with some attention to detail, care and money spent. At the moment, the reviews could be regarded as false advertising. We expected more from an Australian property. We did appreciate being able to check out an an hour late without charge. Great location, clean and well worth staying at. Enjoyed our stay at Gordon Street Cottage. It had everything we needed and in such a great location. We were attending a wedding at the Stamford which was two minutes away on the free tram in Jetty rd and only just a ten minute walk. Highly reccomended. Home was in a great location. The security was great, good lock on front door & carport is fully enclosed. Loved that the home had lots of room, 3 bedrooms. Walking distance to trams, restaurants, shops & beach. We all enjoyed our trip. Definitely recommend. Seamless stay in Glenelg. Very comfortable and homely. Great layout to accommodate our two families. A place with a lovely vibe. Could stay much longer. Thanks so much for the very comfortable beds. Will stay again.